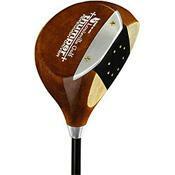 Had been wanting to get this driver for a while, and recently went to the Louisville Golf plant to pick one up. It's impossible to overstate just how "Red" this driver is. You can see it a mile away, and I get a lot of 2nd and 3rd looks from other golfers. Here are the pros and cons I've learned in the 2 months I've been using the FS. Pros- Very easy to hit. Even off-center hits find a piece of the fairway. Looks fantastic at address and gives me a lot of confidence, which is very important for someone at my level. The sound of a well hit drive with this club is awesome, giving a dull but loud nock. Despite my fears, I generally didn't lose any distance, and due to a nice driving trajectory, get about 15-20 more yards on the roll. As I play a lot in very windy conditions, this had improved my game a great deal. Cons- Persimmon clubs reqire more maintenance than metal clubs, so I find myself "babying" this driver more than I would really like, but the trade-off is minimal considering the aesthetic beauty of this club. Because they cost more to manufacture, Persimmon clubs are a bit more expensive than metal clubs, but to me they're worth every penny. Master club maker Ron Just of Louisville Golf shafted and gripped this for me right there on the spot, and even took the time to show me each step in the process of making high quality persimmon clubs, giving me a tour of the entire facility in the process. Everyone at Louisville Golf was very friendly, and treated me as if I was their very first customer. Try getting that kind of customer service from Ping, Nike, or Calloway! !